For the past week or so I've been travelling together with Jimmy. We decided to have a sit down and discuss life, travelling and camper vans..
"I think it's important to have time alone; you don't have to be afraid of being lonely"
Me: So for the readers, just tell us the basics about yourself..
Jimmy: My name is Jimmy Svensson, from Årjäng in Sweden, I'm 33 years old and married with two children. Me: How long have you been enjoying the camper travelling lifestyle? 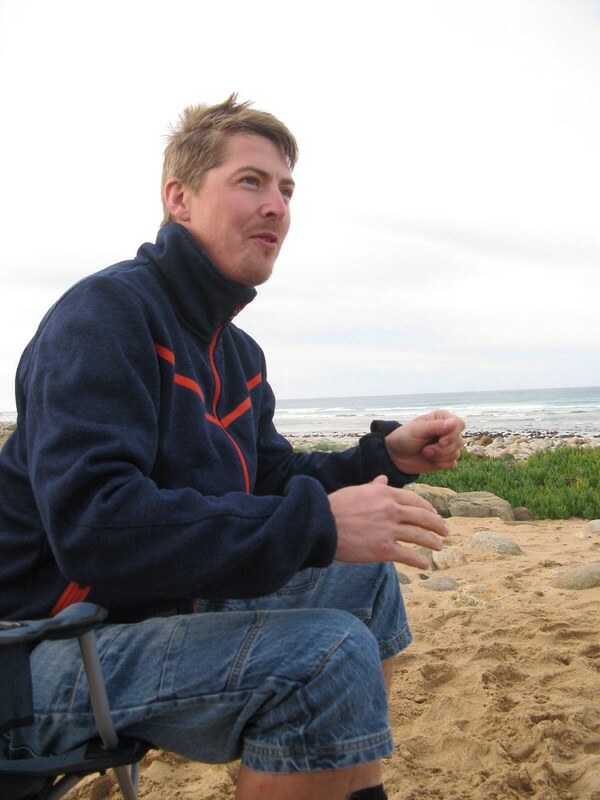 Jimmy: Five years, usually for trips of about one month duration. I'd like to go longer, but there's my kids at home in Sweden. Me: And how do you manage with that? I mean, having family at home, and still wanting to take independent trips..
Jimmy: I like the feeling of missing somebody, especially my children and my wife. I think it's important to have time alone too - you don't have to be afraid to be lonely. It's a nice feeling to do stuff by yourself; you can be proud of being independent, not having to rely on other people. Me: Anything else to say about having a family, and going travelling? Jimmy: Oh, we do go camping together as a family in Sweden, usually only up to a week at a time. In summer, every second weekend we camp in the woods. We also post it on social media, where we're going, and then friends are invited to join us too. Also recently my daughter and her grandmother came down to spend a week with me in Spain. Me: Yes, they were great photos from that visit. "..it seems that many people take on too many financial commitments.. I choose to take on less to have more freedom." 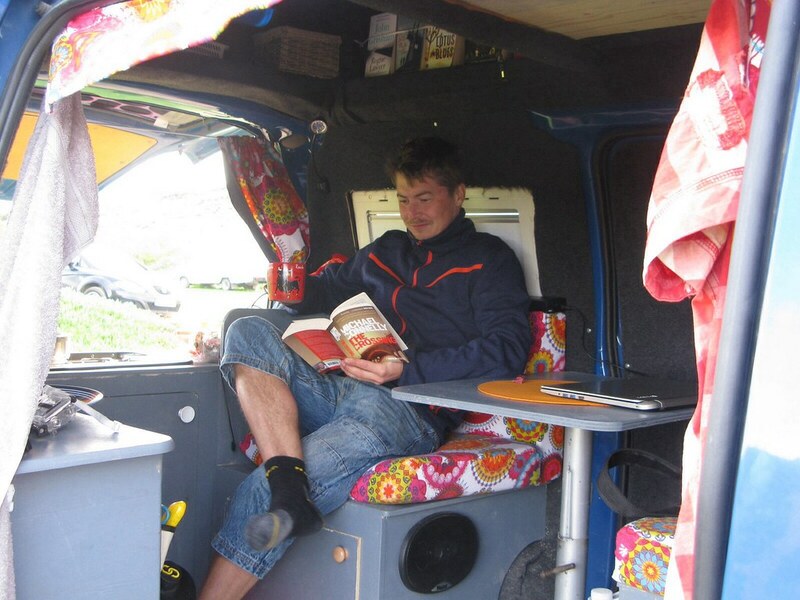 Although he's not full-timing in the van, Jimmy still reaps the benefits that full-timers experience..
Jimmy: Another good thing about having the camper is that I often stay in it for work as well. I work as a freelance roads maintenance contractor and so sometimes I have to travel for work - it means I don't have the accommodation expenses. Me: Oh yes, that's a big advantage in that sort of employment especially. What's your general philosophy about money in life? Jimmy: Well generally, it seems that many people take on too many financial commitments, like big mortgages and the like, then that limits their freedom and ability to travel. I don't make a judgement on this, it's just not my way; I choose to take on less to have more freedom. "It had been a florists delivery van, so it hadn't been under a lot of stress.. I went to Morocco in it." 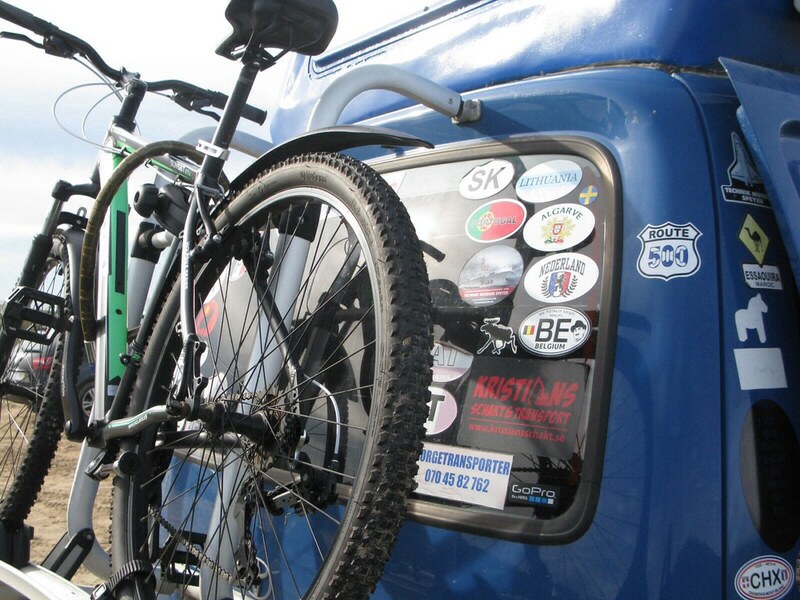 Me: Have you always had the Toyota Hiace camper, or something else before? Jimmy: For the first two years I had a Nissan pickup that I built on a camper back myself. In that I went to the Ukraine by myself, and also we went as a family to Croatia in that one. Then I bought the Toyota Hiace I have now..
Me: Tell us about that, it used to be a work van, yes? Jimmy: It was a florists delivery van, so it hadn't been under a lot of stress. It's a 2008 Hiace D4D with full-time 4WD. I converted it in two stages: the first stage I put on bigger wheels and tyres, fitted a pop-top roof, and a rock-n-roll type bed..
Me: Yes, that's how it was when I first met up with you in Portugal two years back..
Jimmy: Yes, that time I had driven it down from Sweden, to Portugal, and then I went to Morocco in it. Then this time..
Jimmy: Yes. .. 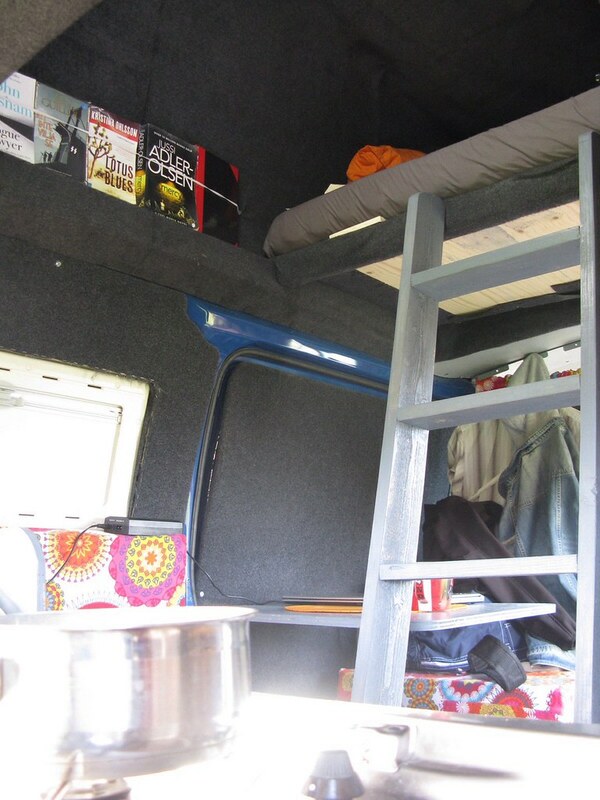 I've changed the whole interior layout, fitted a high-top from a VW T3, and now I can sleep upstairs. Me: Yes, and you do even have stairs! "You don't need a fancy vehicle. Just put a bed in your car and go!" 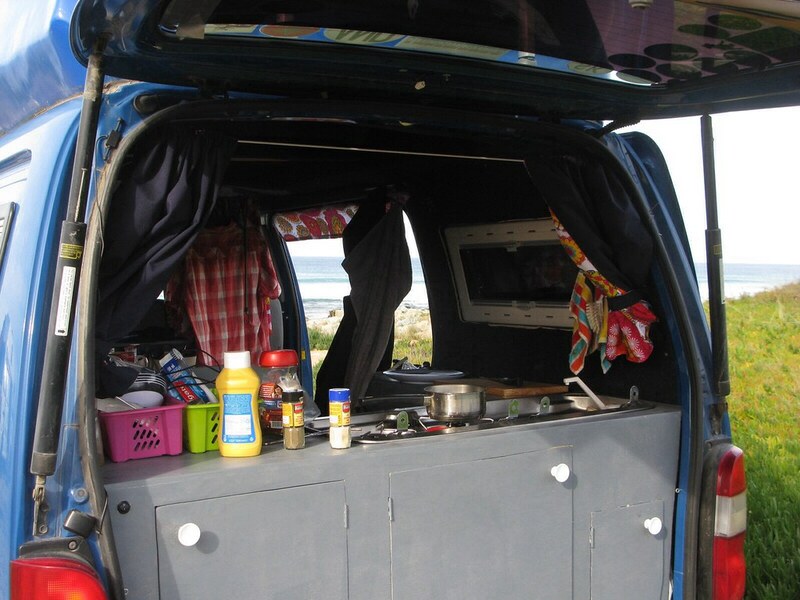 Jimmy's kitchen can be accessed from both inside the van, and used as an outdoor camping galley when the back door is raised. This also acts as shelter. Me: where have you been in it since making the changes? Jimmy: Well, last trip I drove it through Sweden, Germany, France, Switzerland, back into France again, then Spain. There I left it in storage in Alicante and flew home.. It's interesting to note that it's possible to leave a camper in storage parking in Spain for around €20 per month. Jimmy: I'm currently planning my next big trip which will be overland to Mongolia in spring 2018; around a three month trip.. I'll go slowly through Ukraine, Belarus, Russia, Kazakhstan and into Mongolia, then maybe Turkey on the return trip. 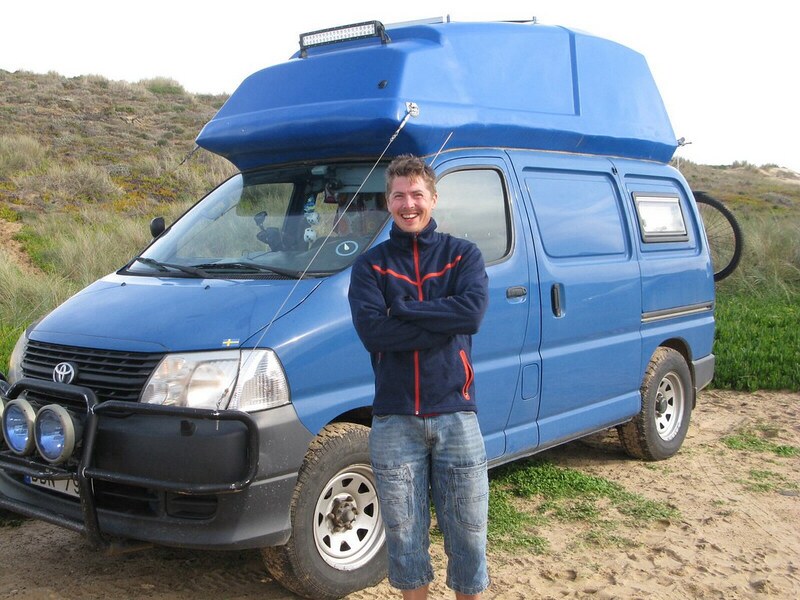 Me: So finally Jimmy, have you any advice for someone who really wants to travel in a camper van? Jimmy: Just go! You don't need a special fancy vehicle - just put a bed in your car and go. Make it simple.. Don't stay in hotels or buy expensive meals out, then you can be out for longer on your trip. Buy your fuel at supermarkets and wherever you get the best prices. Me: Thanks Jimmy. We've had a good trip together over the past week or however long it's been. Great job on the van as well! It's certainly been, as you've taught me to say in Swedish, livet på en pinne! "Life on a stick!" You can find Jimmy's page 'Globetoyoter' on Facebook!